Mexico's new president has unveiled a plan to address US-bound migration, signing an agreement with Central American leaders within hours of donning the presidential sash. 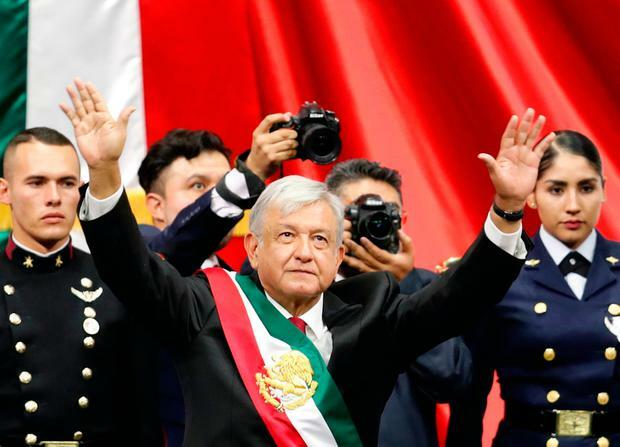 With his friend Jeremy Corbyn, the British Labour leader, among the 400 foreign dignitaries watching on, Andres Manuel Lopez Obrador was sworn in on Saturday. "Present today is my friend Jeremy Corbyn, leader of the Labour Party of Great Britain," Mr Lopez Obrador told the packed Chamber of Deputies, as Mr Corbyn stood up from his seat behind Ivanka Trump to accept the applause. Mr Lopez Obrador thanked Donald Trump for sending his daughter to represent him, and also thanked Mike Pence, the vice-president, for attending. He then moved on to thank King Felipe of Spain and the assembled presidents for their presence. Mr Lopez Obrador - who has vowed to work 16-hour days to resolve the country's many problems - was always expected to hit the ground running, but the speed of the migration announcement surprised many. In a deal that will please Mr Trump, he agreed with the presidents of Honduras and Guatemala, and the vice-president of El Salvador, to create a fund to stem the US-bound flows of migrants. The leaders agreed to ask their finance ministries, in the first quarter of 2019, to come up with a plan of programmes, projects, and specific actions aimed at jobs generation and fighting poverty in the region. The programmes, supported by the respected UN commission for economic development in the region, CEPAL, will seek to make the Central American nations a better place to live, and thus reduce the number of those leaving. Yesterday, Marcelo Ebrard, Mexico's foreign minister, met Mike Pompeo, his US counterpart, and today a Mexican delegation will meet a team led by Kirstjen Nielsen, the US homeland security secretary, to discuss the migrant caravans, and plans to make asylum seekers wait in Mexico for their applications to be heard.